Leslie H. Whitten's PROGENY OF THE ADDER (1965) bears some obvious resemblances to the later novel THE NIGHT STALKER (discussed here last month). Whitten's novel also centers on the hunt for a serial killer who stalks a large city and turns out to be a vampire. The murders pile up, and the investigation gradually uncovers more and more anomalous features, mainly the draining of blood from the bodies. The crimes are traced to a foreigner with a shadowy, suspicious past, who has left a trail of carnage in several different countries. While THE NIGHT STALKER takes place in Las Vegas, the murders in PROGENY OF THE ADDER plague the very different environment of Washington, D.C. The two settings have in common multi-ethnic populations of tourists and temporary residents among whom a criminal can hide. Whitten's protagonist, Harry Picard, as a homicide detective on the police force, confronts the case from an insider's perspective, unlike the outsider's viewpoint of the crusading reporter in THE NIGHT STALKER. Also, by the climax of Whitten's novel, Picard has a personal stake in the case, because the killer threatens a policewoman whom the detective cares for. In a chilling detail unique to this novel, the dead women appear as emaciated as if they had been starved for weeks before their murders. Narrated in a conventional third-person style, rather than the mock-documentary format of THE NIGHT STALKER, PROGENY OF THE ADDER develops at a more deliberate pace than the later book, although still with plenty of suspense and violent action scenes. Although the task force identifies the suspect, Sebastian Paulier, about halfway through the novel, that discovery marks only the beginning of the real quest for the murderer. They learn his address and search his home, but he has fled. They have to spend the rest of the book tracking him down, with several near-miss confrontations. The team listens to Picard's vampire theory with an open mind and readily accepts the idea that anti-vampire measures might have an effect on a homicidal maniac who believes himself to be a vampire. They conscientiously arm themselves with crosses, holy water, etc. To their astonishment, although probably not the reader's, these weapons work surprisingly well. Picard's cross-cultural research into vampire legends is recounted in detail. It does come across as a little amusing, from a post-1970s perspective, when he earnestly informs his colleagues of vampire lore factoids that, thanks to Anne Rice, the TWILIGHT series, and countless other books and movies, have now become inescapable features of popular culture. 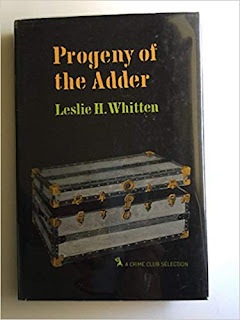 Whitten's vintage horror story creates a sympathetic hero and a striking, scary villain in the context of a well-constructed police procedural plot. Fans of the old-fashioned, murderously bloodthirsty vampire will enjoy this novel.